In a legal opinion dated 29 January 2002, UN under-secretary General for Legal Affairs and UN Legal Consel, ambassador Hans Corell, provided an overview of international law applicable to mineral resource extraction in the occupied territories of Western Sahara. Read it here. At a conference in South Africa, 5 December 2008,, and later in the publication New Routes (2010), Hans Corell elaborated on his letter to the Security Council and how it has been misinterpreted after 2002. Norwegian government has on a few occasions blacklisted companies operating in Western Sahara from its national sovereign wealth fund, calling such operations "particularly serious violations of fundamental ethical norms". These assessments encompass legal, ethical and political concerns. Read for instance this 18 page explanation of a divestment from phosphate importing companies here (2011-2012). European Parliament’s Legal Service concluded in 2009 that EU fisheries operations in Western Sahara were in violation of international law. The strong text demands respect of international law vis-à-vis EU fisheries in Western Sahara and was delivered on 13 July 2009. Jeffrey Smith, Canadian barrister, made the following analysis: "The maritime jurisdiction of Western Sahara and the duty of states to preserve Saharan fisheries resources pending self-determination". Read it here. Simone King wrote her 2005 dissertation at the School of Oriental and African Studies on "The fate of Occupied Territory: Recognition, Non-Recognition, Self-Determination and Prolonged Occupation", based on the case-studies of East Timor, Palestine, Namibia and Western Sahara. Read it here. For an outline of the oil exploration activities in occupied Western Sahara, we recommend Raphaël Fišera's dissertation at the Deusto University of Bilbao. Read it here. 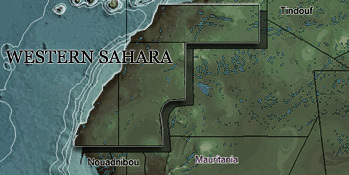 Daniela Hinze's 2003 master thesis at the Freie Universität of Berlin considers the impact of economical interests on the political process towards self-determination in Western Sahara: "Der Westsahara-Konflikt –Die Bedeutung von wirtschaftlichen Interessen sowie politischen Entscheidungen für das Selbstbestimmungsrecht der Sahrauis und den Friedensprozess". Read it here. The Nordic Institute for Africa (Nordiska Afrikainstitutet) has a brochure titled "The Western Sahara Conflict - The Role of Natural Resources in Decolonization", edited by Claes Olsson. It can be ordered through the Institute or read it here.